Established in the northern suburbs of Brisbane in 1989, Northside Removals now has over 25 years of experience in removal services. We have helped hundreds of families throughout QLD to move quickly and efficiently, without spending too much. After all, we want to take away the hassle from the moving experience so that you can sit back, relax, and focus on enjoying your new home! Why Choose Our Team of Removalists? 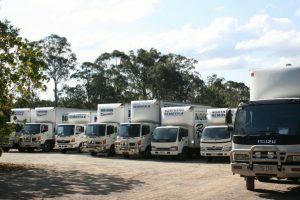 Our fleet of 11 specialised trucks and our staff of dedicated professional house removalists in North Brisbane will help make your move efficient and stress-free. We are happy to assist with challenging or unusual moving projects. In addition to furniture and boxed belongings, we can also provide removals for pianos, artworks, sporting equipment and more! As one of north Brisbane’s premier removal services, you can trust us to transport your belongings safely and efficiently. If you’re moving to a smaller place or don’t need to bring everything with you, we also offer affordable and flexible storage options, both short term and long term. Just ask for an all-inclusive quote when you call. Still wondering why you should choose us for your home removals? All trucks are equipped with trolleys, pads, straps and tools to ensure a positive moving experience. We don’t cut corners when dealing with your belongings; it is our aim to ensure that getting affordable furniture removals service in Brisbane’s Northside doesn’t cost you more in the long run. Whilst our team of house removalists are based in North Brisbane, we service the entire east coast of Australia with confidence. Many of our 100+ moves per week are to New South Wales, North Queensland, even Victoria. When looking for Brisbane furniture removalists that are cheap in price, not quality, choose the expert team at Northside Removals. We are proud to provide more competitive, value for money quotes than any other house removalists on the Northside of Brisbane. With years of experience in QLD’s major cities, we take pride in prompt and reliable house removals, with cheaper prices and a range of options including professional backloads. Please call Peter, on (07) 3882 0777 to get your free quote now. Promising outstanding services, hardworking professionals, and a fast and friendly attitude, our company is your solution when it comes to QLD house removals.